McFarland, USA opens with something rarely seen in non-spoof sports movies: an inspirational halftime speech gone wrong—so wrong, in fact, that Jim White (Kevin Costner) loses his job. As he adjusts to relocation in the small and mostly Latino town of McFarland, California, where he’s procured a last-chance job as a teacher and coach, Jim appears wary of his surroundings while also trying to keep his head down and his mind open. It’s easy to imagine the character as Costner himself, feeling chastened after his clumsy attempts at straight-talking race relations in Mike Binder’s Black Or White just a month ago. As Disney’s latest inspirational sports picture, McFarland has no such designs to tell (a middle-aged white guy’s version of) the truth; it’s neither that ambitious nor that foolhardy. When White notices a group of Latino teenagers with a talent for running, he decides to start a cross country team built around the super-fast Thomas (Carlos Pratts), flanked by the three Diaz brothers (Michael Aguero, Rafael Martinez, and Ramiro Rodriguez) and several more students who show signs of personality but aren’t given room to develop as characters. 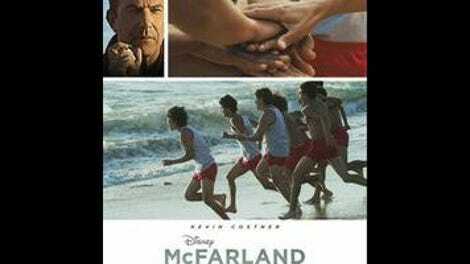 Though the movie generally treats the teenagers as hardworking keepers of the American spirit and highlights how White and his family find a sense of community in McFarland, this is still a story wherein a white man meets a group of non-whites, helps them realize their potential, and shows them the ocean for the first time. (Based on this movie and the recent Spare Parts, the latter is a developing regional cliché). As far as movies like this go, McFarland, USA isn’t a bad one. Director Niki Caro (Whale Rider, North Country) captures the scenic beauty of California repurposed as a series of cross country courses, from the urban landscape of McFarland (the school sits next to a prison) to the lush surroundings of meets that snake through hills and trees. Much of the action is perpetually bathed in magic-hour lighting, and there’s a particularly lovely series of shots where the camera rushes past the covered mounds of farming detritus the team uses as makeshift practice hills as they run themselves ragged. Caro keeps the material picturesque, respectful, and respectable—without crossing the line into real inspiration. The film is based on a true story, but it’s a story that bears suspicious resemblance to the underdog sports-movie formula, where parents initially object to their children’s involvement, other teams are lousy snobs, and the threat of a nicer coaching gig for the hero inevitably (and pointlessly) looms over the narrative. It would be nice to see a movie that maintains Caro’s occasional lyricism while ginning up the confidence to jettison, rather than emphasize, whatever real-life elements that could be most easily refashioned into sports-movie familiarity. Of course, it would be even nicer to see this story from a student athlete’s point of view. Beyond the representation issue, it might allow the movie to eliminate its dull and unevenly developed scenes about the coach’s family (including a barely-there romance for his older daughter), and the accompanying moments where reminders are made to be forgotten, promises are made to be broken (and then redeemed), and younger sisters exist for a handful of sitcom reactions. McFarland does break from White’s point of view for a few scenes here and there involving either Thomas or the Diaz household, showing how they balance part-time farm-picking jobs, school, and cross country. But they remain members of a collective, not well-drawn individuals. The movie shortchanges its likable young actors by placing just as much value on reiterating White-centric exposition; the efficiency of the transition from White’s initial coaching job to McFarland is walked back by a scene where he nonsensically answers job-interview questions on his first day at work. Costner, good as he is here, may be right to keep his head down in the early scenes; he anchors a movie not quite bold enough to break out of a clear comfort zone.